What is it about the Olympics? While the Sochi Olympics came to a close last night, at Camp Towanda we get to experience our own Olympics every year. The intensity of the summer is at its peak. You can taste the special and super secret start in the air (we call it Break Out). Everyone is intensely on an anticipatory edge. Then suddenly the lights go and the horn blares. This is it. Olympics! Throughout the year we live 10 months for 2 with Towanda always on our mind. 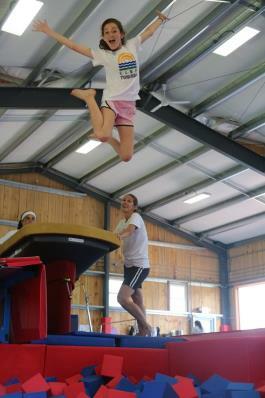 Sometimes at camp it seems as if we live the summer for the culminating days of Olympics. 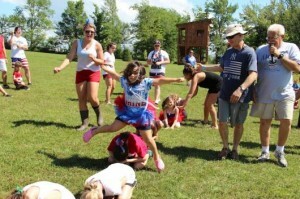 The Olympics of Camp Towanda are unparalleled to any other event. 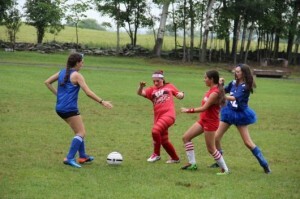 Campers and Counselors alike compete, in good spirit and sportsmanship for Red and Blue. Everyone’s best shines through. Everyone gives it their all. Everyone has an impact. Everyone’s fire burns. However, none of it would be possible without the teams’ leadership. Twelve counselors are appointed as Generals based upon several qualities. A General is someone who leads by example, who is a role model for both co-counselors and campers. Generals represent hard work and stamina. From Breakout until the closing Olympic Sing presentation, the Generals must make sure all the pieces of the Olympic puzzle fit together seamlessly. Tired is not a word in their vocabulary. 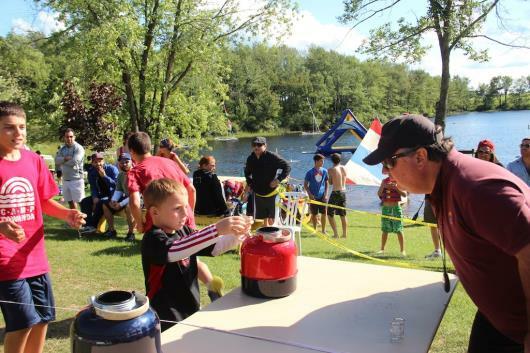 Passion fuels them; the “good of camp” is at their core. 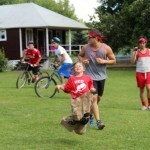 They are supported by a team of spirited, equally hard-working Camper Captains, Lieutenants and Sergeants who serve as role models for all campers. 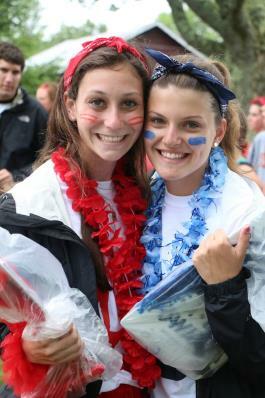 We hear so often that these leadership opportunities help shape the future of our campers and counselors in the real world and in their careers. 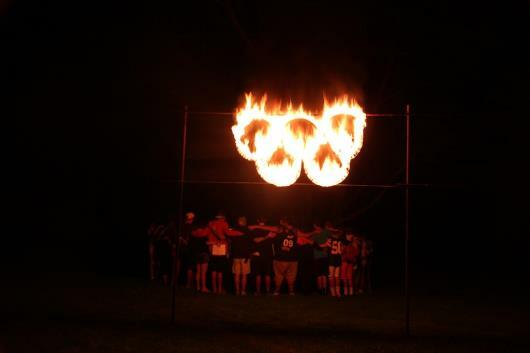 Each year brings a new team of leadership, a new fire to Olympics. The stage for 2014 is getting set*. Is there anybody out there? 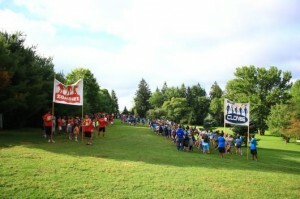 Click here to watch video highlights of our Camp Towanda Olympics 2013! Olympics Day 3 & 4: On Fire! From Rope Burning to Fire Brigade, day 3 and 4 turned up the heat!!! Here are some highlights from the Judgies in black. 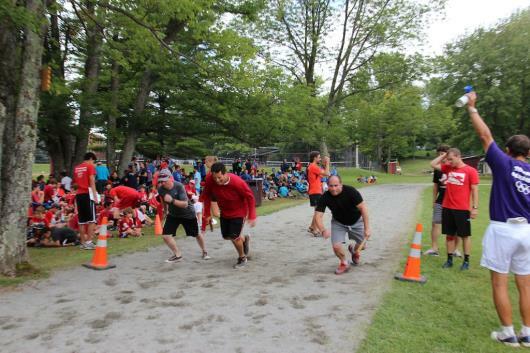 On Day 3, the Boys had their showdown on the track at record speeds, culminating in a classic Judgies vs. Generals race for the record-books. 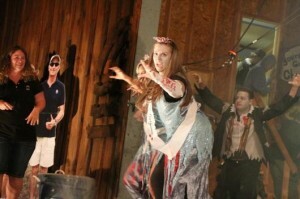 Two heats of Judgies from four different eras competed against the Zombie and Clone Generals. Casper joined in the race, helping the Judgies win by a “nose” as the Blue General, Diego “Day La Fuente” took one for the team at the finish line! It was the perfect way to end our morning at the track. 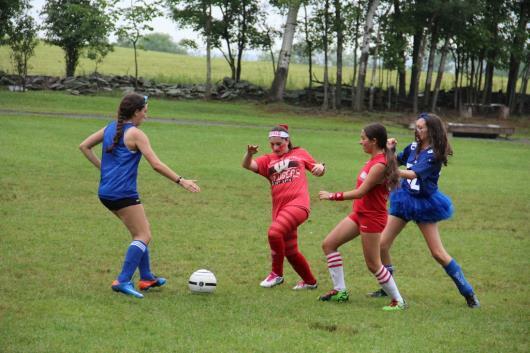 From the Judgies point of view, the campers have really tried SO hard. They left nothing on the field. They pushed themselves to do their absolute best. They participated in EVERYTHING…even if it was a little outside their comfort zone. It’s all for the team. By Day 3 dinner time, you could feel the electricity in the air. A shift in energy. The camp was getting pumped up. The song “LIGHT EM UP” by Fall Out Boy played over the loud speakers as the teams entered line up. At dinner, the Red and Blue teams took turns, pumping up their team for ROPE BURNING! 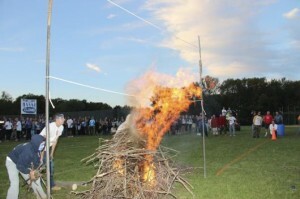 Everyone participated in Rope Burning, even if they are on the sidelines. The cheering section is equally important to those who are geared up to help “build that fire, higher higher”. When the Judgies arrived at Skyview Field, you could hear a pin drop. 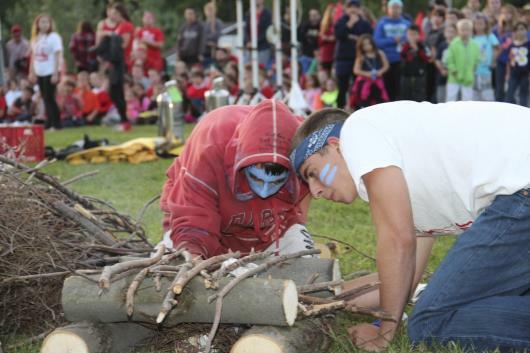 The Blue and Red Ropeburning teams sat in the ceremonial circle in absolute silence. Their Generals and Ropeburning coaches gave inspirational pep talks, helping them understand they will remember tonight for the rest of their lives. 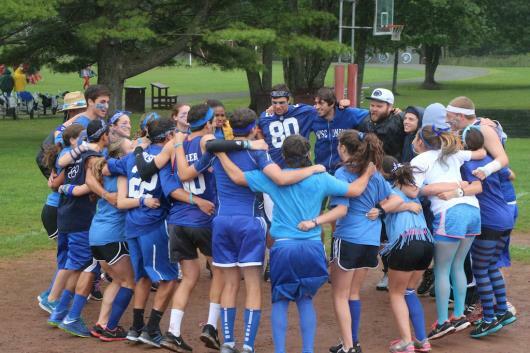 For the Alumni Judgies, this tradition evokes incredible memories and nostalgia. It is so hard to explain how Rope Burning is the best night of camp…but it is true. It holds special significance for the Club boys building the fire, but the whole camp really comes together. It is epic. 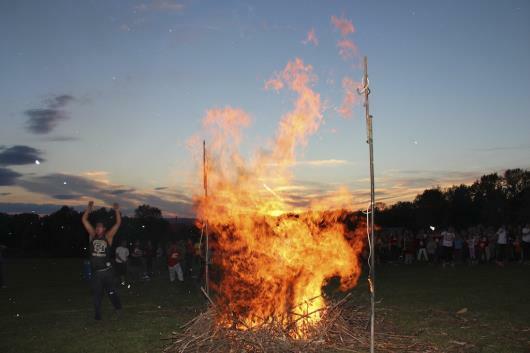 The rope burning teams were incredibly focused and determined, from the wood gatherers to the runners to the sorters to the stackers to the feeders to the firebuilders. When Blue lit their fire first and burned the first rope, it looked like a sure thing. But their fire started to shift away from the top rope, and Red came back to burn their second rope in under 13 minutes. Blue burned their top rope just a minute later. After it was done and the fires extinguished, the emotions were indescribable. Dorm and Club uniting under the firey sky. All ages, boys and girls, congratulating, crying, hugging (lots of hugging), smiling, all exhausted and energized at the same time. This is when camp comes together. Camp brothers and sisters leaning on each other. There was no slowing down on Day 4 of Olympics. A morning of activities, some beef-a-roni for lunch (to which the whole mess hall was cheering “Beef-a-Roni”!!! ), and then the Great Apache Relay (did you follow the live social media feed from the race course?). The Apache consists of over 200 events that end in the Fire Brigade at the waterfront. 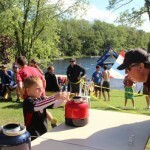 Events include athletic challenges, crazy tasks and silly fun. 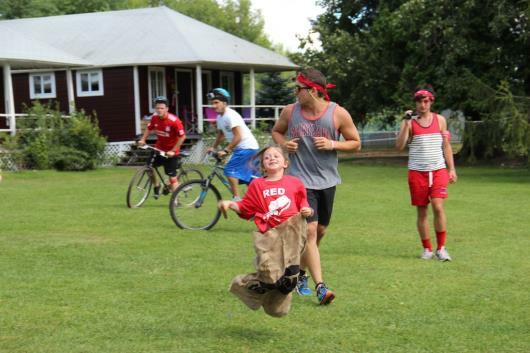 You could have a Deb in a potato sack hopping across girls camp against an Upper Camp boy! Anything goes in Apache. And the lead often changes MANY times. We encountered a 10 minute rain shower…okay, downpour, but that did NOT slow down the relay. The baton changed hands over 200 times. There was a lot of running. Kyle Manes and Jonathan Penner, two incredible staff, ran alongside the campers during the entire race which finished in under 2 hours. Other Judgies followed on a golf cart, Generals on bicycles, campers and fans on foot. It was incredibly organized and smooth! Everyone contributed to the outcome. In the end, Red filled their water jug first in Fire Brigade and they were declared the winner by a small margin. Last night was silent BBQ (yes, this is a judged event) and knockout. 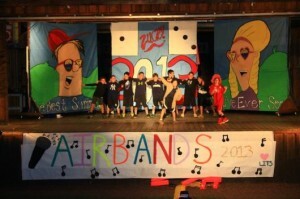 We cannot believe Olympics is coming to a close tonight and look forward to the much-anticipated Olympic Sing and skits. A big thank you to all the Alumni and Guest Judgies who helped make this Olympics such a success. Olympics Day 1: Rain or Shine…Game on! 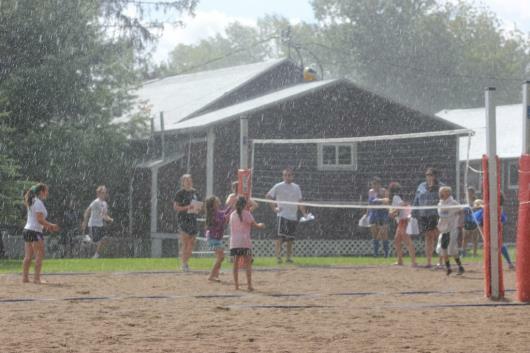 A little rain doesn’t stop Olympics!!! Despite the gray skies, mist, rain and damp chill; NOTHING stopped ALL the CAMPERS and STAFF from wanting to get out on the fields to play! In between heavy downpours, we got in most of the scheduled competition between The RED ZOMBIES and BLUE CLONES. From my vantage point as the Grand Master of Ghost, I witnessed the best match ever of Debs & Dills, playting with their heart and soul in the mud and drizzle…to a tie-breaker; the same was true for the Tweens and the Middie Boys. 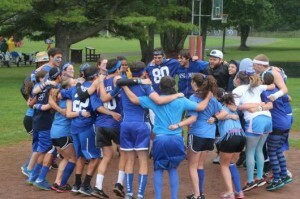 An intense coed LIT best of 5 went the distance through rain and mud as well. The thrills, the cheering and the concentration was wonderful! From the coaches to generals to the amazing judgies (consisting of over 65 visiting alumni)! The reports are that all activities were the same intensity and spirit; From volleyball, soccer and indoor basketball to Gaga and softball! It is so evident that all that our camp is about comes to fruition in these latter days of the summer; the camaraderie, the respect, the reaching for one’s personal best, the becoming comfortable outside of one’s comfort zone and the genuine pride, sportsmanship and deep friendships are making this OLYMPICS indicative of why we are all here. It is a proud feeling that I see and sense on everyone; including the alums that have just showed up; they see it, too! At the end of Day ONE, there is just a 2 ½ point difference between the teams…how about that? Songs of the day played here: TIME OF THE SEASON by the Zombies and and WE ARE ALL CLONES by Alice Cooper. Today will be beautiful! Cool in the low 70s… a great day for the track and swim meets and tug of war!! PULL, THAT, ROPE!!!! THIS IS IT- Olympics 2013!!!!! 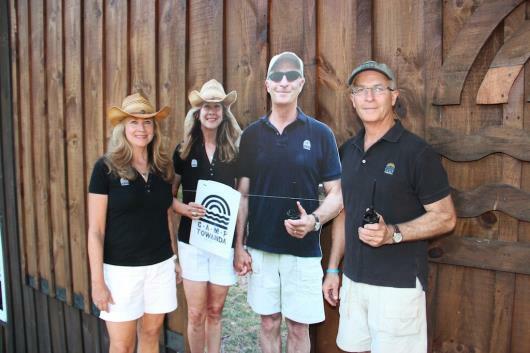 It started on Visiting Day, the clone pictures were popping up around camp; really scaring us all a bit…or fooling us……. One night I had the Bob & Amy pix in the mansion living room…and I jumped! They were on the porch, at the board, at line-up, on the golf cart, at tennis, on the courtyard, in the alley, on OD patrol at night and yes looking at the camp cam and at the amphitheater…. Each day, moving around… we were all having fun with it and the talk was that it was spooky fun! That’s it, just a fun camp thing…not one mention of a possible theme for Olympics. Fast forward to today; another top 10 beautiful day…activities, inter camp games and the intense scrutinizing anticipation and bewilderment of when, how and will Breakout happen… at breakfast, lunch or dinner…but how? We are going to the County Fair Friday???? 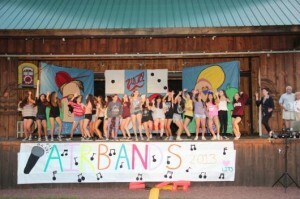 Evening activity was AIRBANDS; a very entertaining lip sync/MTV type of night…. 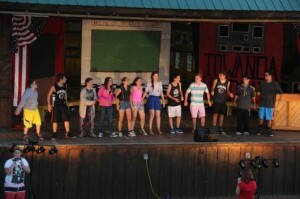 Different groups performing and cracking up the crowd at the same time…..everyone gathered in the amphitheater as a beautiful sunset transformed the sky. Although the crowd, from the youngest Deb and Jets the “on the edge” to Club/Dorm watched and participated……all eyes were on “anything”! 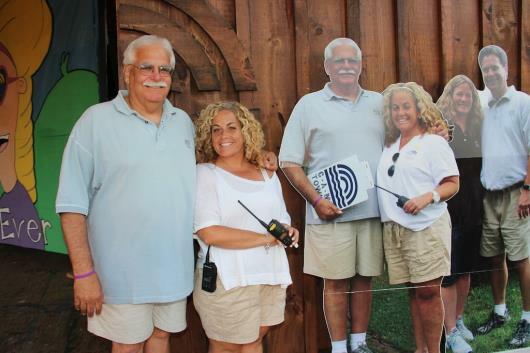 The last act to perform was a group called “The Clones”, consisting of HC’s Bob, Amy, Michael and Lisa, along with Mitch and Stephanie…we got on stage, dressed in the exact same outfits as our clone pictures, who were already on stage……. The spotlights burned through the air, and then the music from Michael Jackson’s Thriller began… The HCs started to do their best Michael Jackson Thriller dance as I pounded on the stage floor. 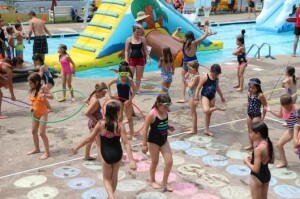 A trap door slid away and 2 aluminum hoses flopped onto the floor facing the audience…. Thick, heavy, low lying mist crept along the floor towards the crowd, down the steps of the stage, engulfing the stage floor and down onto the lawn towards the kids…. the mist grew more eerie, thicker and engulfing the entire amphitheater……. As the smoke, fog and mist were cut by the beams of the spotlights. The Thriller music stopped…and then Pink Floyd’s IS ANYBODY OUT THERE started. The head judge announced : THIS IS IT, Towanda..OLYMPICS 2013!! Pandemonium, thrills, screams, hugs, tears, huddles, as the generals, camper captains, lieutenants, and sergeants were read! Everyone was happy for them….. 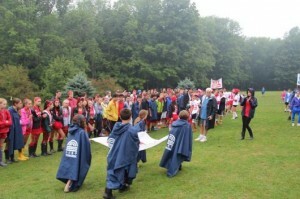 The cloud and mist continued as the team splits were read and everyone joined their team. 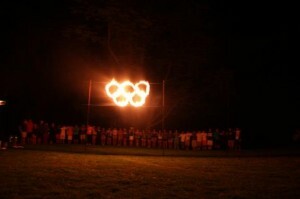 After brief team meetings, both teams line dup on the grassy knoll as we lit the Olympic rings to the Olympic fanfare. Olympic taps..all to bed. To say the least, it was great. Putting it together is like organizing, preparing and getting ready for a big show while the sell out crowd is already in the audience! it was fun and everyone felt a part of it. Lots of grins and great feelings. Good luck to the RED ZOMBIES and BLUE CLONES! Let the games begin. I will be at Ghost! 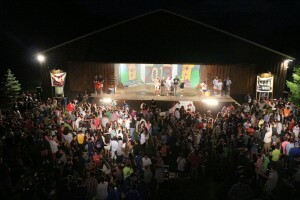 It’s time for another edition of Mitch’s blog/mix mashup…Camp Towanda updates set to music (we’ve added the You Tube music links for your listening pleasure). With week 6 getting underway, there is definitely something IN THE AIR TONIGHT. YELLOW SUBMARINE. Yesterday actually felt like a Sunday. Dark, damp and heavy downpours. Actually felt good; giving us a chance to have some rainy day activities , extended rest hour and a little “Bunk-O” before our indoor rainy day BBQ! At flagpole line up last night, there was strange delay with the flag lowering bugle…created quite a stir. Then at tonight’s show, there were reports that my shirt color, my raincoat, kept changing colors every few minutes… red to blue to red to blue! At the end of Friends, Alma Mater & Taps, the lights went out, Pink Floyd’s ““Is there anybody out there?” intro sounded, the fog horn blasted; kids and staff started screaming and then I simply announced there was going to be an 8:30 AM Reveille! You can sense the excitement and anticipation…who knows when, how , where and what?????? Stay tuned..will be in a few minutes?, hours?, days? Or at all!!! After taps, I marched the TWEENs through the shadows of the night lights , serpentined around the older kids who were under the basketball lights…into the mess hall, then into the kitchen where they thought they were going to mop and clean; instead, I surprised them with make your own ice cream sundaes; it was all fun and games until Stephanie heard the noise came into the kitchen and we all scattered…hiding under the cook’s table, in the vegetable section and the walk in fridge….Stephanie caught us, but then joined us in the ice cream party… it got crazy as I “distributed” the toppings in an incredible dumping of “way too much oreos, sprinkles and syrup” to the kids…it flowed over their bowls, on their arms, down the table and onto the floor…everyone was laughing in amazement and incredible disbelief… a great fun ice cream party….afterwards, they marched silently through the night back to their cabins, not getting caught by The Head Counselor, whispering “this never happened”…a secret between, me, Stephanie and the Tweens! SHHHHHHHH. After cleaning and resetting the kitchen, we did the same thing with the Middie Boys; all the same except, the boys were really sloppy and smelly! Just completing an OD patrol with Stephanie and Amy, The Girls Head Counselor (HC), we talked about how incredible the aura of camp is, we proudly refer to the special feeling that happens at camp once we pass the visiting day hump…everyone is smiling, feeling good, active, excited and just overall, part of the Camp Towanda FAMILY! I feel that I am not even coming close to what happens here; there is a bond and sense of being part of something special and welcoming and comforting; that just brings out the best in each individual here. PS: I actually have fun thinking of Song Titles! 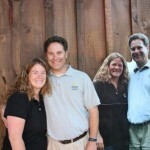 In this edition of “Where are they now?”, we have not one, but TWO couples who met their future spouse at Camp Towanda! 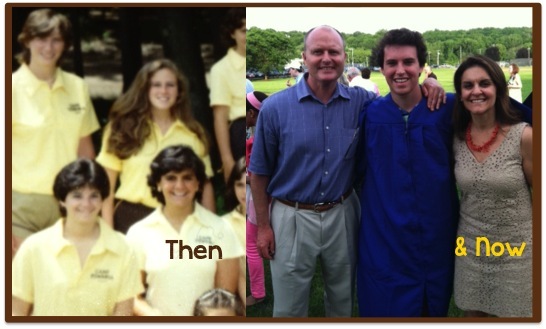 Spanning the 80s, 90s and 00s…here is this week’s Alumni Spotlight! 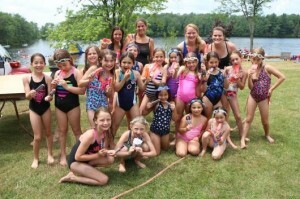 Please keep your entries coming and send to lauren@camptowanda.com. We have so many more great ones to share with you! 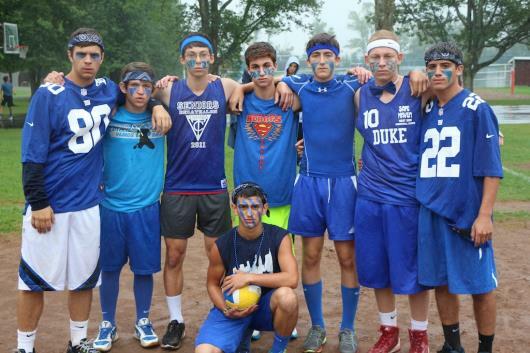 Until next week….enjoy this trip down memory lane as some of our Alumni share their fond memories and insights about the camp we love! Did Towanda help prepare you for the “real world”? In what way? I learned about trust, teamwork, and independence (and some small mischief). What words of wisdom would you share with today’s campers? Enjoy your summer freedom while you can. Fill in the blank: When I think of __glass soda bottles_____, see____brown and gold____, watch____someone skiing off of a motorboat___, hear ____Taps_____ or eat ___pizza with corn meal crusted to the bottom______, I think of Camp Towanda! Did Towanda help prepare you for the “real world”? In what way? 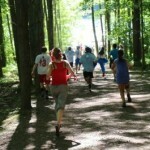 Camp allowed me to learn how to make choices (and mistakes) for myself in a safe environment. What words of wisdom would you share with today’s campers? 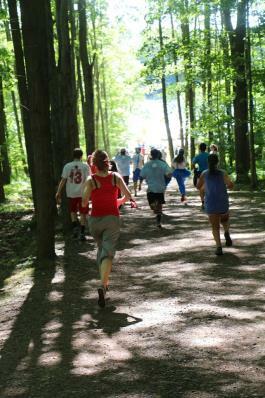 Embrace each moment…and savor the sights, sounds, and smells of camp…they will stay with you for a lifetime. Fill in the blank: When I think of ___(too many to mention but…)_the lake, Shangri-La, the dirt road, the fly tape, milk call, Visiting Day lunch of fried chicken, brownie, and a plum___, see__a fanta soda bottle______, watch________, hear reveille, taps. 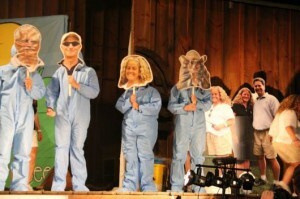 or____”is anybody out there?”____ or eat _cereal from a small box _________, I think of Camp Towanda! If you could add an event to The Great Apache Relay, what would it be? 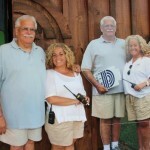 List in order, all of the owners of Camp Towanda! Did Towanda help prepare you for the “real world”? In what way? Yes, made me a better friend, and more confident. 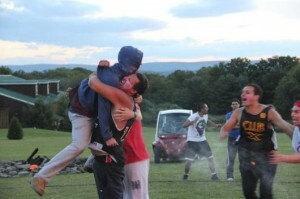 What is your most memorable moment at camp? 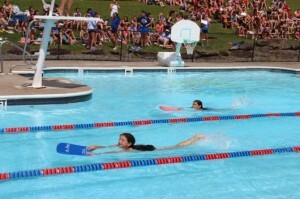 Winning the camp triathlon when I was 11. What words of wisdom would you share with today’s campers? Enjoy, try everything and have FUN!!! Be as nice as you can— which is hard at times. 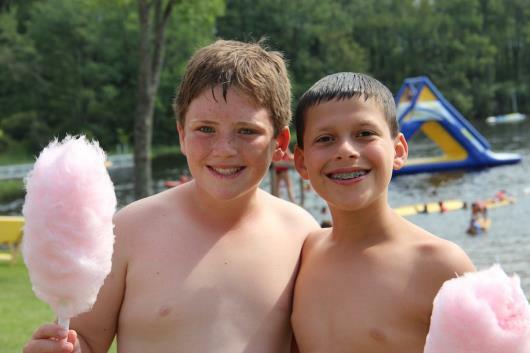 Fill in the blank: When I think of my happiest summers as a kid__, see_____a campfire ___, watch_fried green tomatoes _______, hear ____pink Floyd is there anybody out there.____or eat _Charleston Chews _________, I think of Camp Towanda! Did Towanda help prepare you for the “real world”? In what way? Definitely. Towanda taught me how to be responsible, innovative and developed all my leadership skills. 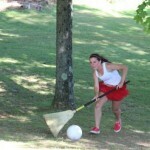 In addition, for the communications field, I learned great Public Relations when dealing with parents of my campers. 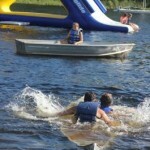 Camp taught me to be independent, to be a member of a group and how to form long lasting relationships. What was your favorite camp activity? The old school evening activity of Panic! on girls camp. What is your most memorable moment at camp? 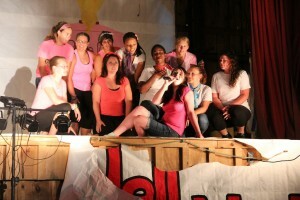 My most memorable moment at camp was when I was an assistant Group Leader for the Debs in 2010. Their sing was “Towanda runs on Debs & Dils.” Seeing them work so hard at an activity that I used to love as a camper was super special, especially because we won! It was so great seeing all their hard work pay off since debs and dillies usually never even place! What words of wisdom would you share with today’s campers? Put away all the extra gadgets that we have today! Enjoy this time and always include one another. There is no time for drama during the summer. These friends you make here will be with you for a long time! 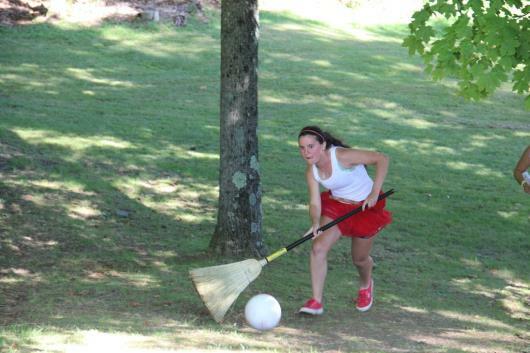 Always be spirited and always have fun! Your making life time memories. 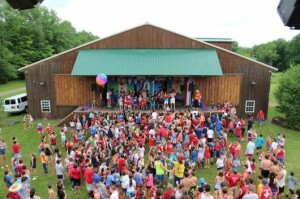 Fill in the blank: When I think of summer, see anything red or blue, watch Wet Hot American Summer, hear American Pie or eat a Chicken Patty, I think of Camp Towanda! If you could add a rule for GHOST, what would it be? You could step on the lines when there is only one person left!! Did Towanda help prepare you for the “real world”? In what way? The real world is all about relationships. The best ones I ever had were at Towanda. 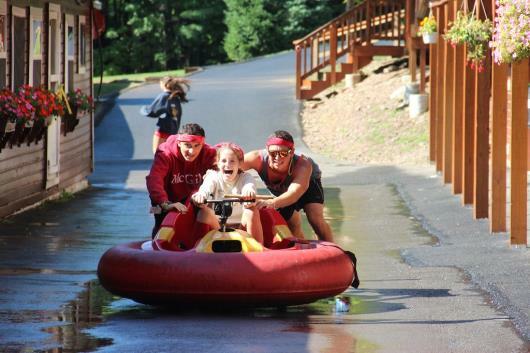 What is your most memorable moment at camp? The first time I kissed my wife. What words of wisdom would you share with today’s campers? Cherish this time, now and forever. Fill in the blank: When I think of Slim Sterling, see a campfire, watch a Hank Azaria movie, hear taps or eat a Chef Rigby Cookie, I think of Camp Towanda! If you could add an event to The Great Apache Relay, what would it be? An all girls ropeburning right before the Water Brigade of Apache. 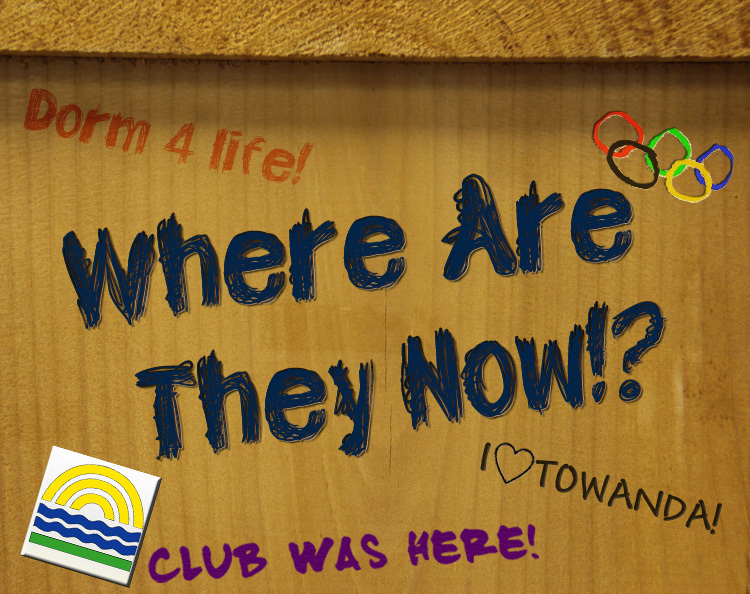 As we gear up for Visiting Day weekend and our Annual Alumni BBQ (Sunday, July 21st from 11am-3pm–21 years and older)…it seems like the perfect time for our 2nd Edition of “Where are They Now! ?” The entries have been a terrific trip down memory lane! Keep them coming!!! 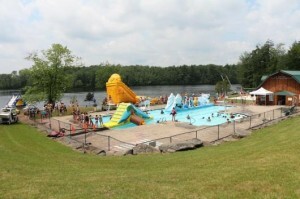 Send to lauren@camptowanda.com. 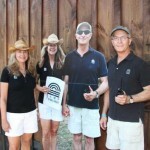 And don’t forget to join our LinkedIn Group: The Camp Towanda Network. So without further ado, here are 5 new Alumni spotlights starting with Wendy Levine Slater. Wendy is a former camper, counselor and camp-parent! Did Towanda help prepare you for the “real world”? In what way? Towanda prepares you for parenthood, especially if you were a counselor. As a camper, it teaches you coping skills, independence, and how to get along with a variety of people with very different personalities and skills. What words of wisdom would you share with today’s campers? 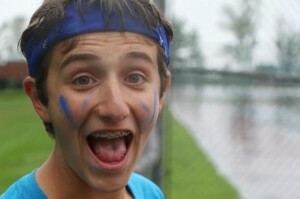 Camp is an invaluable experience. You are so lucky to have this opportunity. The things you learn, the friendships you make-You may even meet your future husband or wife! The memories last forever and every year during the last week of June my spirit is on those coach buses as they leave for Honesdale. If you could add an event for the Great Apache Relay, what would it be? You could have to say the alphabet backwards. 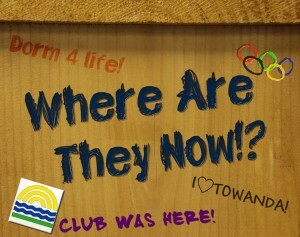 Fill in the blank: When I think of ___good times____, see__Timberland boots______, watch___summer olympics_____, hear _____American Pie____ or eat ____chocolate chip Cookies______, I think of Camp Towanda! *Craig and Marnie Cooper met at camp and are now first-time camp parents!!! Did Towanda help prepare you for the “real world”? In what way? Yes it sure did, it helped me become more independent and have more confidence in myself. 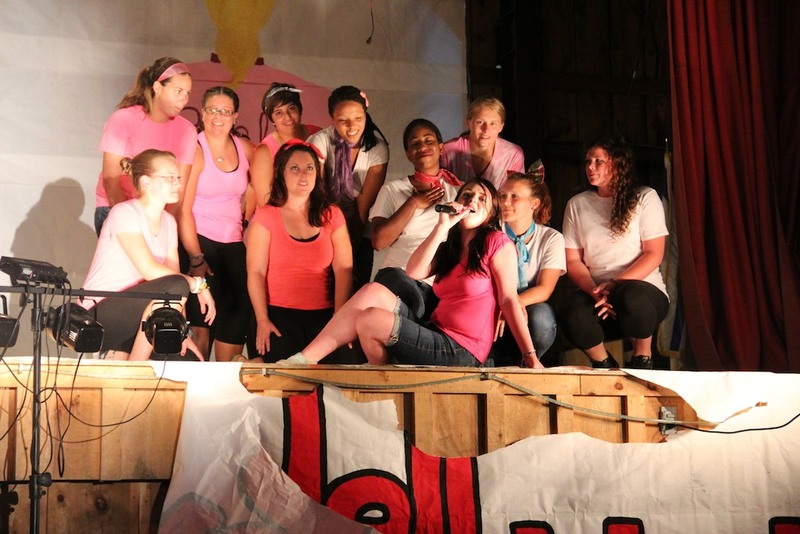 What is your most memorable moment at camp? In 2004 the Senior Boys during Olympics played one of the most entertaining softball games I have ever seen. It went back and forth and Blue won in the 15 inning. Give us a line or two of your favorite camp song. Friends is such a great song as it sums up what Towanda is all about. What words of wisdom would you share with today’s campers? Be yourself, don’t change yourself, have fun and don’t sweat the small things. 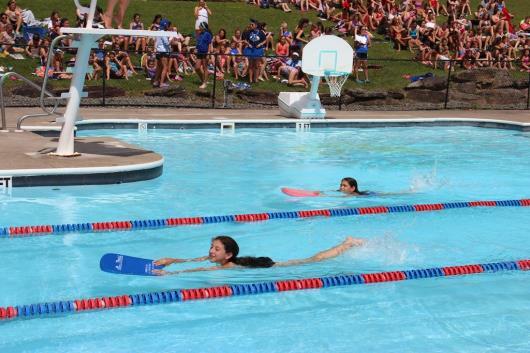 Fill in the blank: When I think of ____summer___, see_____Olympics___, watch____certain movies____, hear ____American Pie_____ or eat ____Soup______, I think of Camp Towanda! If you could add a rule for GHOST, what would it be? At the time of my last year if you caught the ball after trying to be hit one of your teammates was not brought back in so I would make that a rule. Did Towanda help prepare you for the “real world”? In what way? Absolutely. I had no homesickness going into college or moving to Chicago (where I currently live). I’m also very independent and can take care of myself. 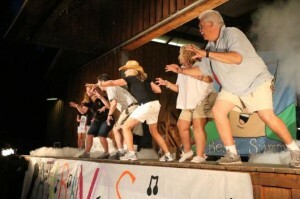 What was your favorite camp activity? Duh. Arts and crafts! 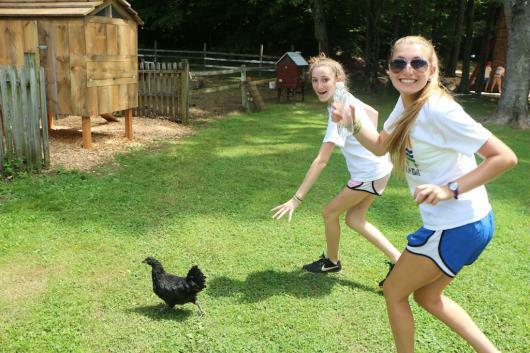 What is your most memorable moment at camp? Way too many! But one I think of off the top of my head is practicing dorm sing (at an undisclosed location) while no one in camp knew where we were. Give us a line or two of your favorite camp song. 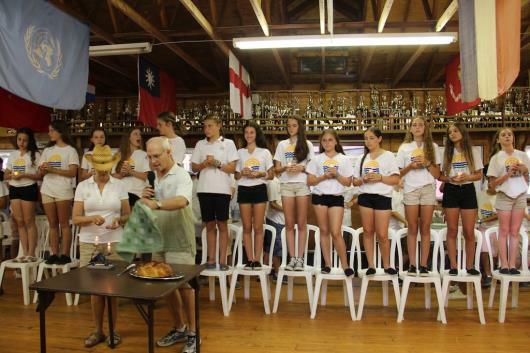 We welcome you to Camp Towanda…. What words of wisdom would you share with today’s campers? You are so fortunate to have the sleep away camp experience because at 25 years old, my camp friends are still my best friends and no one knows me like they do. Fill in the blank: When I think of ____any childhood memory___, see____soffee shorts____, watch____the Olympics____, hear _____taps____ or eat _____grilled cheese_____, I think of Camp Towanda! If you could add a rule for GHOST, what would it be? My ghost memory is foggy. But perhaps if something happens, a second ball is triggered into the game? College Attended? Skidmore College BS in theater. MFA from Actors Studio Drama School in Acting. Current Career: Actor, Director of Education of a film institute called The Picture House in Westchester, and a Mommy! Did Towanda help prepare you for the “real world”? In what way? Yes, in so many countless ways. But one that stands out: I learned to be a leader at Towanda, but I also learned how to allow others to be leaders. It was this awareness and respect for everyone’s contribution to the group, that I learned from Towanda and I have taken with me throughout life. 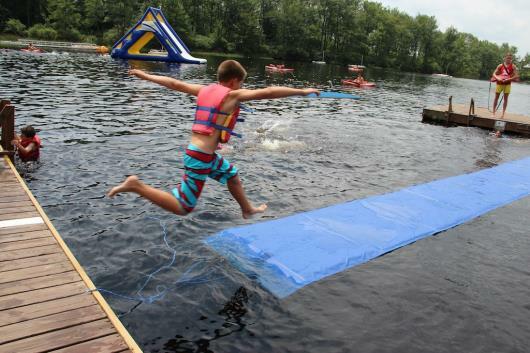 What was your favorite camp activity? So many…girls sing, cricket, porch lunch, trading stickers, jacks, being with my friends. 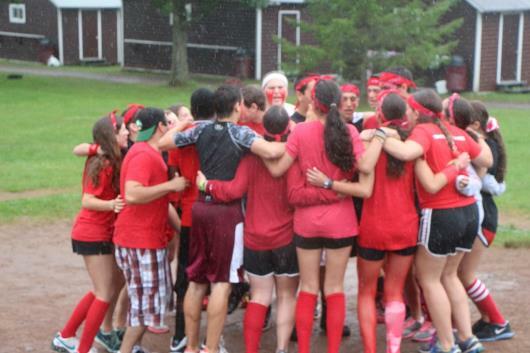 What is your most memorable moment at camp? When my boyfriend held a big box radio, over his head, outside my dorm window and played “In your eyes”. Now that’s old school! I don’t think kids these days know what a box radio is!! Give us a line or two of your favorite camp song. “Here nestled in the hills the camp I love.” But I can remember mostly every camp song I ever learned and I love them all. What words of wisdom would you share with today’s campers? Learn from your counselors. When you look back on your childhood, you will realize they were like little mommies to you. They taught me the importance of traditions, of taking care of myself, how to solve problems, how to push myself to achieve (one time my counselor allowed me stay at the water front for a whole day to learn how to dive…and I learned). You will remember the things they teach you and you will cherish them. From the simplest: how to sing your guts out, to learning how to make a bed with hospital corners, to putting on a pillow case…to the most meaningful: being a dear friend. 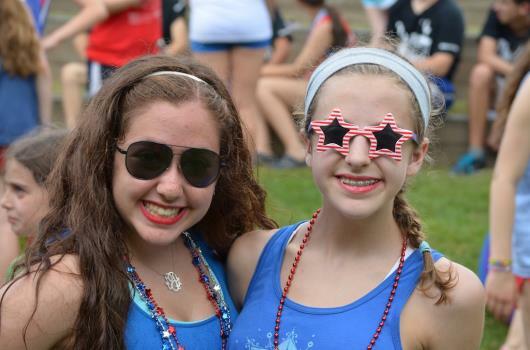 Fill in the blank: When I think of __singing __, see__a lake___, watch__olympic rings burn____, hear ____”is there anybody out there” or eat ___chocolate pudding with peanut butter_, I think of Camp Towanda! We started with a lazy morning outdoor buffet breakfast……The nationals are on their multi-day excursion; the CITs had a day off and the rest of us had a B-L-A-S-T at the water carnival; wet=wild=warm…on rides, slides, floats, boats, popcorn, cotton candy, watermelon, ice pops, hoses, golf balls, rapids and floating stuff! Good music (of course) and heat…….hours of splashing and dancing! 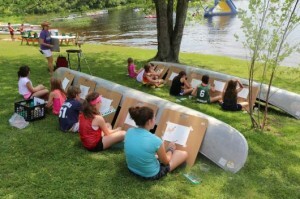 Stephanie even had a Fine Arts Class lakeside in the afternoon. Ending with our smorgasbord dinner; then Girls played PANIC (some sort of fun girl game) and the boys had Home Run derby…then, because we thought all star game was tonight (in past years it has always been on this corresponding date), we went with watching baseball bloopers and Abbot & Costello’s WHO’s ON FIRST (THAT never gets old) under the stars on the big screen (did you catch us on the live cam? )….while Bob The Boys HC, along with Howie our Program director, grilled dogs, served popcorn and hawked root beer (just like at the ballpark)…..another great camp tradition. The Fun continues; we have Circus Workshops during the day today, Electionality at night (one campaign slogan for camp president says” Vote for us, we would give you a chocolate chip cookie, but we don’t have any”! You gotta love that! I was speaking with the CITs (our 17 year olds) They were just hanging out, talking with me and Stephanie; joking, laughing and just enjoying each other’s company; at the end of the conversation, they said they “…love camp (most of them here already for 7-10 years so far) because one reason is that if they were ANYWHERE else, they would be texting; it is just more real here”. I need not say anymore! This place is magical on so many levels; I know I say it often but the growth, the confidence, the experience we see develop and improve EVERYDAY is phenomenal. 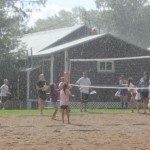 I realize that some of you get different messages from the letter or phone call, but HERE, IN THE MOMENT, each camper is thriving, at their own pace and what is good for them, without being compared to anyone else. 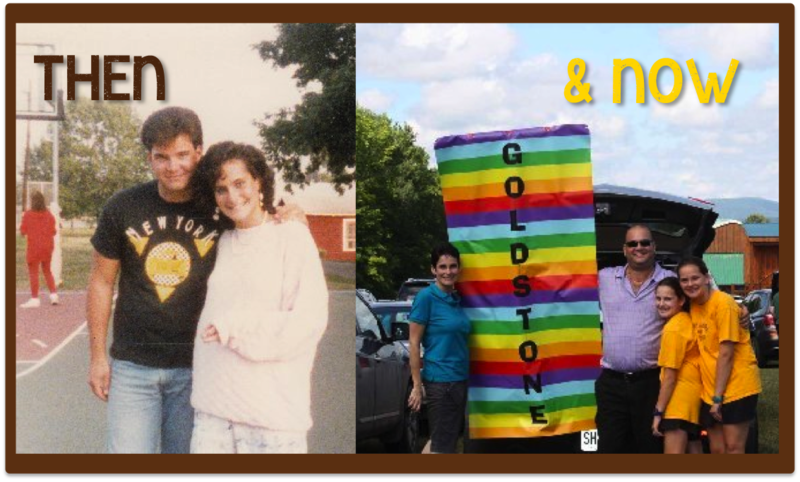 It just keeps on getting better…….the Camp Towanda family! P.S. Just in case you haven’t ever seen Abbot & Costello’s Who’s on First…it’s a must. 4th of July Weekend Recap! 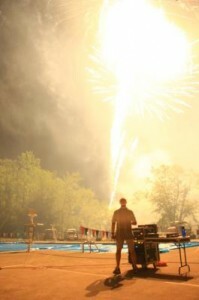 What an action-packed, HOT 4th of July weekend we had here at Camp Towanda. Did we mention HOT? There’s so much to share…where to begin? On Thursday (July 4th), we started reveille with patriotic fanfare as the Debs and Jets presented the colors at flagpole while the entire camp saluted in red, white and blue garb! The morning coed-ing activities were fun and entertaining; from sidewalk art, kickball, tennis, volleyball to soccer, ghost and basketball. We all had fun while American Tunes played all day, Lunch featured apple pie and AMERICAN PIE (of course)! After lunch we had a blast of a live concert in the amphitheater (aka Campapalooza) with beach balls, water hose and red, white & blue ice pops. After the concert , we all achieved our Guiness goal of having over 500 people leap frog (crazy fun) altogether! You have to watch Friday Nite Flix to see it! Later in the afternoon, Lower Camp had General Swim with me and Casper (going down the slide) while Upper Camp squeezed in one more co-ed activity! Dinner was an All-American BBQ, listening to the Grateful Dead’s AMERICAN BEAUTY Album! Grilled ribs, chicken, corn and pasta…and watermelon! All, under a beautiful setting sun as the audience really enjoyed one of our best plays ever, as Upper Camp presented High School Musical; fun, entertaining and engaging..an awesome finish to a great day. Did you check out the highlights on Friday Nite Flix? Milk and cookies and then bed for a well deserved rest before we start up again Friday for a complete day that included inter camp games (tennis, Lax, soccer and basketball), the Dorm Girls’ Canoe Trip, Services at Sunset Lake followed by awesome and highly anticipated fireworks show (over the lake and set to Tchaikovsky’s 1812 Overture…a camp tradition) to cap off our Independence Weekend celebrations. 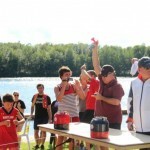 Friday (the 4th on the 5th) was an awesome 95 degree day; sweaty activities, fusion water and the misting fan, refreshing general swims, inter camp games and the Senior girls canoe trip! Even our chickens left the coop! It was also our annual Silly Name Day! Ask your kids what their name was? Shabbos dinner, services at Sunset Lake as the sun set followed by a heart throbbing, enthusiastic and intense fireworks display to Tchaikovsky’s 1812 Overture….man, it was great! Want to hear SOME MORE? Saturday we woke up early to another hot day and our S’MORE TOUR for future camp families! 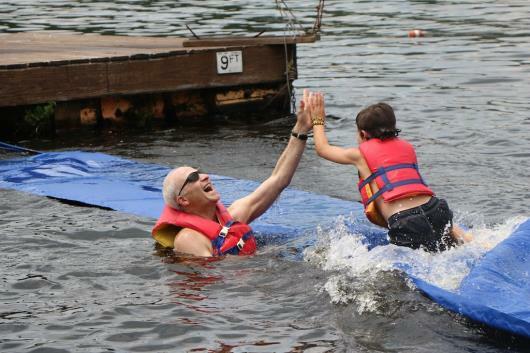 Great to see new families (and some familiar faces–2nd and 3rd generation alumni) experiencing the fun, spirit and life at Camp Towanda! The Talent Show in the amphitheater was incredible; fun, extreme talent, and amazing confidence that produced audience participation and enthusiasm! I am not just saying this, but it was one of the best Talent Shows we have had in years…..
Sunday was a real chart-topper….almost an 100 degrees scorcher!! Lower Camp enjoyed an extended General Swim; Casper and I “frolicked” with Lower Camp in the lake (which felt warmer than the pool) as we rode the awesome water slide and surfboards with the campers! 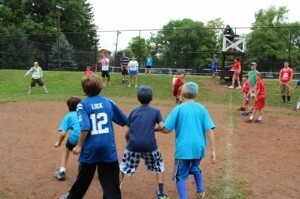 All while inter camp games continued with baseball, tennis and basketball games. Our Grateful Dead BBQ almost got rained out but the thunderstorm just missed us and we were able to squeeze in the evening activity scavenger hunt! 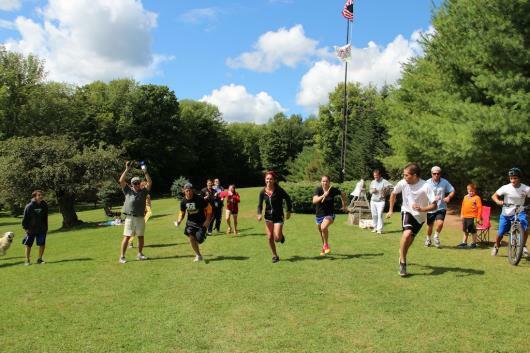 It is really great to see ALL ages have good ol’ fashion fun; running around as a group, with their counselors, trying to figure out clues. As the sun went down last night, it seemed to have taken the humidity finally with it. 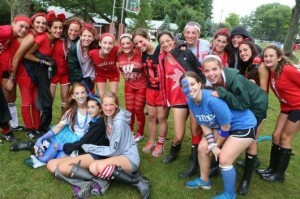 Camp is great, we are all bonding, smiling and enjoying, even the simple things. We hope you all enjoyed your 4th of July weekend as much as we did and be sure to watch this week’s episode of Friday Nite (we mean Saturday Nite) Flix!